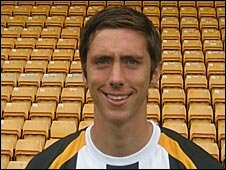 Blue Square Premier side Salisbury City have extended the loan of Port Vale defender Luke Prosser by another month. The 21-year-old, initially joined on a month-long loan with teammate Danny Glover and has impressed in the six games he has played. Salisbury have rejected the chance to extend the loan of striker Glover and the 19-year-old will return to Vale. Both players were among six put on the transfer list at Vale Park before the start of the new season.